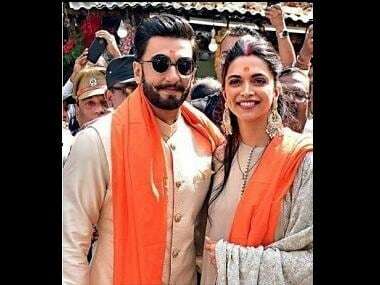 Deepika Padukone and Ranveer Singh tied the knot in a traditional Konkan ceremony on 14 November at Lake Como, Italy. The couple also have their Anand Karaj ceremony on Thursday morning, 15 November. many Bollywood celebrities took to social media and congratulated the couple. Filmmaker Karan Johar was among the first to tweet his good wishes. Neha Dhupia wished for the marriage to be their "biggest blockbuster." Comedian Kapil Sharma also shared a photograph of the couple from their appearance on his show. Amul shared a doodle of the couple feeding each other buttered toasts. Durex, which is endorsed by Ranveer Singh, also shared a cheeky message. After their very private wedding ceremonies, the couple will have a reception each in Bengaluru and Mumbai on 21 and 28 November respectively.